The Common pipistrelle is a small, dark brown bat with no fur on its tail membrane and a wingspan of 180-240mm. It has an agile and erratic flight and uses a hawking technique to prey on small insects. This species forages in a wide range of habitats, such as open woodlands, over wetlands, farmland, semi-deserts and urban areas. P. pipistrellus frequently roost in crevices in buildings and trees but can also hibernate in underground sites during severe winters. P. pipistrellus is a rather sedentary species, with summer and winter roosts often only 20km apart. However, long distance migrations have also been recorded. Stable according to the IUCN Redlist. 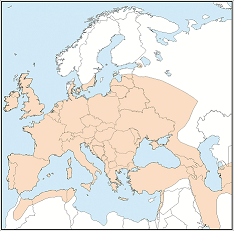 The range of the P. pipistrellus extends from the British Isles through southern Scandinavia, over much of Europe to the Volga and Caucasus. It also occurs through parts of north-western Africa (Morooco, Algeria and Tunisia) and south-west Asia to central and eastern Asia. As a high proportion of colonies are found in buildings, the species may be particularly vulnerable to other anthropogenic factors, such as disturbance, timber treatment and building renovation.